California State University, Northridge’s youth summer camps will return this June for social enrichment activities that can guide children in critical thinking, athletics, problem solving and innovation, leaving them with a memorable summer experience. Registration is now open for all summer programs throughout the CSUN campus. Summer Academic Program for Elementary School Students (SAPESS) will be offered from June 17 through July 19. 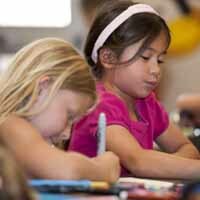 This program is for incoming grades 1 through 5 and has been in operation for 37 years. SAPESS stresses critical thinking, self-reliance, problem solving and innovation while having fun. “These programs are great for children because they also expose them to being on a college campus. It is a great way for them to have a positive experience at a university and to get them thinking about their future,” said Jill Frieze, one of the program’s coordinators. Robotics, which teaches students in grades 4 and 5 to build operational robots. Computer Coding and Simple Machines for grades 2 and 3 helps children learn how to build simple machines and create their own computer games from scratch. Science class teaches science concepts through hands-on experimentation. Art instructs children how to create projects using a variety of media and incorporates concepts such as design, color, etc. To register for SAPESS, visit https://sapess.wufoo.com/forms/sapess-2019. SAPESS offers a limited number of scholarships for qualifying families, which reduce the tax-deductible fees by 50 percent. To find the information for financial aid, go to the website and click on the “FAQs” link under the Parent link.